After having trains rumbling past my house 24/7 being flooded out twice.were I am now thought I herd the grass growing this morning sitting out in 28 degree sun. NO M1/planes/.ice addicts,car hoons/streets full of household items/no curb or un sealed rds ......................I'M IN HEVEN! can even name each cane toad AH to be a QUEENSLANDER AGAIN! the only thing to spoil my leaving was travelling over 100ks by train free then having to pay $16 to exit the airport what a shock to visitors to our city & also what a eyesaw BELMORE PARK has become a temp tent city for the homeless! What made me extremely happy today is that 3269 has moved back to Aldgate. Reports of it doing 894s this morning, and then it did 2 865s and an 864F this evening. Bound to happen really, buses can't stay at Mt Barker permanently, due to lack of workshops at Mt Barker. busrider wrote: Bound to happen really, buses can't stay at Mt Barker permanently, due to lack of workshops at Mt Barker. It has been in the workshops during its 2-3 months at Mt Barker (heard it over the bus radio). It obviously went straight from Mt Barker to workshops the back to Mt Barker). It seems to always come to Aldgate for school holidays (which suits me fine ). It can be at Mount Barker one day, and Aldgate the next. There's no specific time in which it stays at either. Vehicles are regularly rotated between Edinburgh North and Pooraka, as well as Lonsdale and Seaford. So who knows, it could have done an 863 on an Aldagte shift, and then an 838 on an MB shift. Last edited by Lt. Commander Data on Sat Jul 09, 2016 11:53 am, edited 1 time in total. Finding 443 on the O'bahn without using Transit Times. TA3001 wrote: It can be at Mount Barker one day, and Aldgate the next. There's no specific time in which it stays at either. It's not a bad thing if it means more good buses don't end up at a certain depot that has a rather large portion of unprofessional drivers who don't care about following the already loose timetables. TA3001 wrote: Finding 443 on the O'bahn without using Transit Times. I did that the first time I saw 443 on an O-Bahn shift last year. It's great when it happens. What made me happy today was one of my driver mates doing the 17:05 822, so I jumped on and captured heaps of photos in interesting locations. Perhaps people weren't pressing the buttons correctly? Those big round buttons in the earlier CB80s aren't actually wired to anything, the sound they emit when pressed (correctly) is picked up by a microphone which triggers the next-stop bell and light. Rattling a set of keys can also set it off, along with many other high-pitched noises. busrider wrote: Perhaps people weren't pressing the buttons correctly? Those big round buttons in the earlier CB80s aren't actually wired to anything, the sound they emit when pressed (correctly) is picked up by a microphone which triggers the next-stop bell and light. Rattling a set of keys can also set it off, along with many other high-pitched noises. Is it possible their finger/hand was covering the hole behind the button? That stops the "clever" device from working (speaking from experience here, try it next time you're on a CB80). Winning a 1970s Victa on Ebay for $20.50. It has the relatively rare 125cc motor. Similarly styled to the one in my avitar - but different colours. Happy mowing! Swift's Avatar wrote: Zumbo's Just Desserts 7:30 tonight on 7. Obtaining the original style grass catcher for the vintage Victa mower I just bought. Riding, recording and photographing bus 3310 on a weekend. Seems like it was the only interesting bus out today, possibly minus 3311 which I passed twice while on 3310. First time, with 41/42 questions correct. 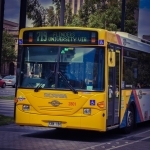 What made me happy today was getting photos, a recoridng and a ride on bu 422, the oldest bus in revenue service with the Adelaide Metro (since 421 has been removed). And it was a longish ride as well, not a piss-short one. The New Kmart ad on TV. Good work Kmart.